Colonial documents of the Viceroyalty of Peru include writings where the author presents herself as an Indigenous individual. Historians of the colonial period have long cast doubt on whether these documents were really written by individuals of Indigenous origin, since only the Indigenous elite had access to formal education. Nonetheless, many documents can be found in the Peruvian Archives (Archivo General de la Nación, Archivo Arzobispal de Lima, Archivo Regional de Ayacucho), and other, that identify the ‘writer’ as being of Indigenous origin. I focus in this presentation on a selection of legal complaints, ‘authored’ by Indigenous individuals from the early 17th century, that I have collected. The qualitative and quantitative linguistic analyses focus on personal narrations and commentaries found in 18 legal complaints. Using methodologies from Narrative Analysis (cf. Labov & Waletsky 1968) and Critical Discourse Analysis (cf. Van Leeuwen 2007, 2008), three types of Indigenous documents emerge. Further semantic analyses reveal a set of distinct narrative patterns that distinguish these documents from those written by Spaniards, and highlight one particular subset of the Indigenous documents as being the most likely to have been authored by an Indigenous individual. The narrative patterns include pragmatic meanings found in Andean languages, under the grammatical conceptual category known as evidentiality. This category, defined as the ‘marking of source of information’ from the perspective of the speaker (Chafe & Nichols 1986; Willett 1988; Aikhenvald 2004), is found in Andean languages (Hardman 1986; Weber 1986; Faller 2002, 2007), including Quechua, the main Indigenous language of the region. The Indigenous documents display differences in narrative strategies, in the understanding of what is ‘true’, and in signaling a subaltern social stance. 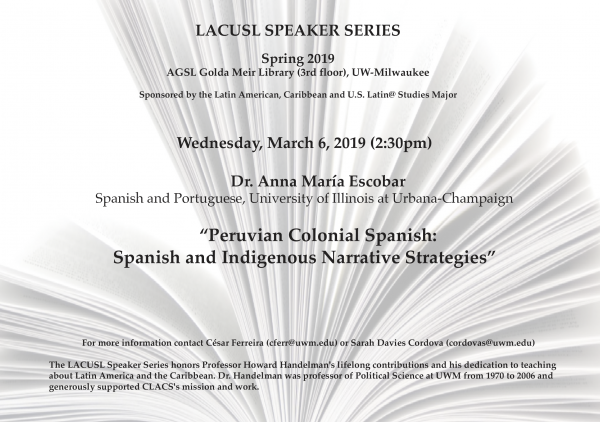 I argue that these distinct narrative patterns display a colonial Andean speaker’s point of view that, in turn, point to an Indigenous author.